The medieval town of Stralsund on the Baltic coast of northern Germany was a major trading centres of the Hanseatic League in the 14th and 15th centuries. In the 17th and 18th centuries they became Swedish administrative and defensive centres for the German territories. 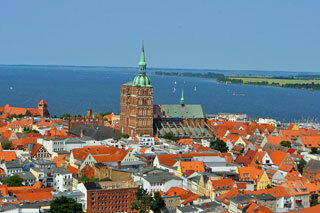 It contributed to the development of the characteristic building types and techniques of Brick Gothic in the Baltic region, as exemplified in several important brick cathedrals, the Town Hall of Stralsund, and the series of houses for residential, commercial and crafts use, representing its evolution over several centuries. This article uses material from UNESCO World Heritage List article "Stralsund Old Town", which is released under the Creative Commons Attribution-Share-Alike 3.0 IGO License.